To accommodate their younger customers, Clarins have created an entirely new collection of products that brings out the best in young skin. 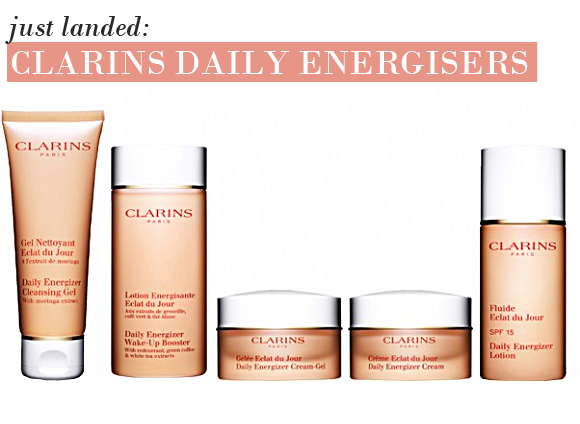 The result is the Clarins Daily Energizers range, a collection of radiance boosting products that enhance your natural beauty and reduce imperfections without harsh measures. This foamy cleanser is perfect for all skin types. It respects the balance of both dry and oily skin, and clarifies the complexion so that it is completely detoxified of pollutants and grime. Make-up is cleared away, and the skin is left looking clear and clean with a reduction in the appearance of blemishes. The natural extract of moringa flower neutralises the effect of pollution, making for the perfect base. This gorgeous gel is the perfect antidote to dull morning skin. It’s like a dose of liquid energy, infusing skin with natural ingredients and antioxidants that work to brighten and enliven the complexion. You use this after cleansing, and apply it as you would do a toner. This gel has the added benefit of being incredibly softening and moisturising, so skin isn’t left feeling parched. If you’ve got normal to combination skin, plump for this moisturiser. The melting and lightweight nature of the cream-gel texture means that oilier skin types aren’t drenched in needless excess oil, and the velvety formulation dries to a perfect matte finish. It has a big dose of energising Vitamin C to ensure that minor imperfections are evened out gradually, and microcirculation is boosted. Protect your skin daily with the lightweight Daily Energizer Lotion with an added SPF of 15, a formulation that is suitable for all skin types. It’s oil-free, non-greasy and very comfortable, making it perfect for everyday wear. As with all of the Daily Energizers range, the lotion boosts the skin’s radiance and clarifies the complexion. Minor imperfections are reduces and the microcirculation is boosted to give you a lovely natural glow. This entry was posted on Tuesday, July 12th, 2011 at 8:00 am and is filed under New products, Skincare. You can follow any responses to this entry through the RSS 2.0 feed. You can skip to the end and leave a response. Pinging is currently not allowed.